Raptivity - Rapid Interactivity Building Tool: Transforming your Content into an Experience. Throwing your existing slide decks (with minimal tweaks) up on the intranet and calling them e-learning is guaranteed to bore your learners stupid, send them to sleep, complain bitterly about this rubbish, and have your boss calling you into his office ‘for a quiet word’ and asking you to shut the door behind you! Lots of bullet points and text heavy slides are boring, unengaging and makes learners feel like they have fallen into a horrible time loop of ‘Click Next to continue’. You may as well have given them a book or a PDF document to read. Some people add a 10 question multiple choice quiz to the end of such a deck and call it e-learning. Personally, I call it ‘Hell’. For e-learning to work, learners need to be engaged. We want them to interact with the module. We don’t have the benefit of being in a room with 12 other people to have a discussion about the learning content. Generally it is just them and their computer. We want to avoid the repetitiveness of clicking the same button day in and out. If PowerPoint is all you initially have access to, don’t think of creating a traditional presentation. Delete all the placeholders and start with a blank slate. Then get a bit creative. PowerPoint doesn’t need to look like PowerPoint! One way to get them engaged is to give them a real world scenario and get them to make decisions based on information they can pull from their resources. For example, if you are teaching an individual a new product, create a replica of where they would be selling it via photos or drawing (context). Have a customer enter the store and ask a question about the product (real world example), and supply the resources via a story or a simulation of what they would actually do to help the customer e.g. ask a virtual boss, review their virtual intranet etc, and then let them choose the correct answer to supply back to the customer. An interaction can be as simple as an example picture of people doing the wrong thing, with an explanation of why. Much better then click next, click next, do a quiz! These interactions are simple to produce using PowerPoint's ‘Insert Action’ command. If you aren’t confident (don’t worry you will as you practice) there are a number of products you can invest in to assist you create engaging interactivity. 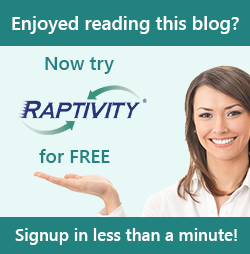 One great starting product is Raptivity. Is there a danger of having too little interaction? What about too much? How do we balance the two? Get them to do something besides click next. Depending on how you set things up they may be able to click, hover or drag and drop. A good rule of thumb is to get learners to do something every 3-4 slides depending on content. However it is important not to just string multiple interactions together! Give learners a break occasionally to prevent cognitive fatigue, and the reflect on what they are learning. It needs to be there but don’t overdo it! How much time (and most importantly, money) is really involved in getting quality e-learning up and running? However much you want to invest. You don’t need to spend an arm and a leg to get started. Most people have access to Microsoft PowerPoint. Start with it, and if desired, add a product like Raptivity. Once you have developed with those tools then build your toolbox with other tools, or programs, as you experiment and evolve as an E-learning developer. Most importantly, be prepared to invest the time to learn about, and keep abreast of the latest developments in the e-learning industry. Matt Blackstock is a husband, dad, consultant, learning & development specialist and self-confessed geek. He prefers laughing while learning, not taking himself too seriously and promoting learning as a fundamental understanding of the ‘whys’ as opposed to “do these three steps” or “remember these five tips”.